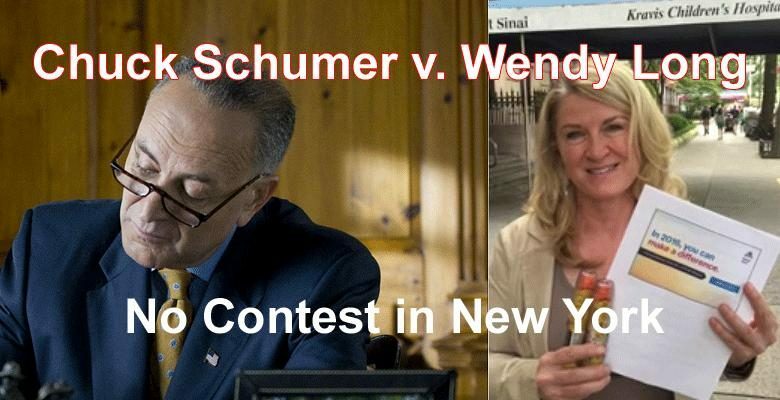 Incumbent Democratic Senator Charles (Chuck) Schumer is a shoe-in to represent New York State for another six years after three full terms in the position. It’s like a one-party state with no competition in the primary, and only token competition in the general election. RESULTS: Democrat Chuck Schumer wins with over 70 percent. Republicans hold the Senate. Conservative Republican Wendy Long is not a serious candidate. Republicans will not even bother trying to run someone who might win. Republicans are not willing to place a New York appropriate moderate in the race. Basically, this seat was conceded before the contest began. Despite his guaranteed win, Chuck Schumer is still the sixth highest funded Senate candidate for 2016, with $23,795,775 to date. Securities and investment is his top contributing industry, with other large corporate interests pitching in. Why? If the money is not needed to win the election, it must be that the money is needed to influence the powerful Senator — unless we believe that business likes to waste money on causes other than its own bottom-line, a belief that would create a whole different huge problem for the economic notion of efficient markets. Republican challenger Wendy Long has received a measly $160,195. This one party state Senate race situation is not limited to Democrats — it happens in both the deep blue and deep red states. One possible method of reducing the one party state aspect of these deep colored states is to run someone in the primary. Unfortunately, in 2016 in New York this did not happen. It is possible, however. In 2014, Democratic challenger Zephyr Teachout ran in the primary to unseat same-party incumbent governor Andrew Cuomo. With very little press, Zephyr Teachout received more than 35 percent of the vote. She is now running for Congress. UPDATE: Zephyr Teachout lost 55 to 45 percent. Editors note: This is the first in a series on “2016 Senate Races.” Tomorrow, we will take a look at the California race, where there may be a solution to the one party state problem.